How do you feel about the mosquito hum in the evenings andtheir desire to drink your krovushki? If OK, then you can safely engage in the creation of their own pond. But remember that the warm water will be different lure mosquitoes, so in the evening gatherings will have to transfer to another location area, where mosquitoes less. Consider how you can make a pond with his hands in the country in different ways. Which body of water do you need? Small vodoyemchiki that are created as part of the landscape composition and are not intended to rest beside them. Decorative ponds with shallow streams, fountains and waterfalls of the zone of family holidays. "Personal" of the lake, which trigger fish. Reservoirs for water treatment (domestic pools). If you intend to use an artificialbody of water in the country at the same time for swimming and contemplation of lush vegetation and floating fish, be warned: the construction of this facility is expensive and in the end, you swim in it stop. For water treatment and plant lifeA completely different water. 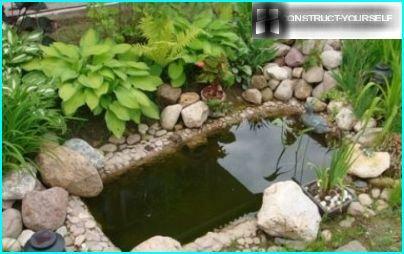 Swimming pond it is necessary to cover the roof, fell to less waste, put water filters permanently remove silt, mosquito larvae and foliage. Otherwise, the pool will be a hotbed of illnesses for your family. Plants also need a different climate, and the construction of the pond will be cheaper. The quickest way to draw a smalldecorative pond in the country - is to make it from some old containers discarded by you or the neighbors. It is best to find the product capacity of more than a hundred liters, because the smaller the container during the heat quickly dry up and need to constantly add water. And if vacationers come just for the weekend, then planted in the pond plants can not wait for them and die from "thirst." The best option - a reservoir in the country out of the bath. Many people today are changing the old steel or cast-iron models more practical acrylic, if not replaced by showers. It only remains to find out who makes the repairs, and take his "construction debris" to his dacha. 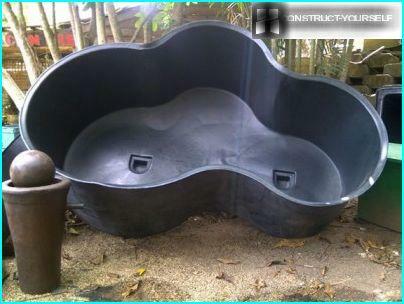 When the bath "got" on the site, choose a place where your pond is located. It is desirable that he was in partial shade and in the lowland. Digs a pit, whose height is 30 cm morethe height of the bath. Sypte Earth once in a wheelbarrow or bucket and taken away, because it is not useful to you. If you create a body of water already on the finished lawn - Cover the film to him to the earth disintegrated did not spoil the landscape. Drop a bath in a hole previously compacted and leveled floor. Check the level of the horizontal arrangement of the edges. Fall asleep in the voids between the bathroom and the ground sand and sealing it with a stick. Along the perimeter dug baths remove the sod and dig a trench in the knee (to the upper edge of the bath). Since the tub wall is too smooth and lookunnatural, Let us give them the irregularities and change the color to beige. To do this, buy the glue that bonded ceramic tile, we plant it according to the instructions, add beige dye and the viscous mass is applied with a gloved hand on the inner walls. The layer should be thin and uneven. Blanking bath wrap and leave to dry for a day. On the edge of the bathtub and laid on the excavated trenchthe perimeter of the metal grid on it and pour a thick concrete solution by adding stones. This bezel will not crumble and will provide the pond edge strength. The same solution we coat the drain holes in the bottom and the wall of the bath. Subject to full hardening. To resist the plant roots at the bottom, filled in a bath of dry clay layer 6 cm. Cooking in clay viscous mixture, diluted with water,and the whole cement slurry, located along the perimeter, we coat. You can immediately fix in clay roots of perennials, which will decorate the edge of the pond, and the top layer of earth fill. According to it, spread decorative stones and planted vegetation. Inside the bath, place the spring water lily bulbs that flower in the summer she pleased. But in the winter it will have to put into the bucket of water and hide in the basement. The easiest way to the reservoir unit in the country to make avia the purchase of finished cups made of PVC. 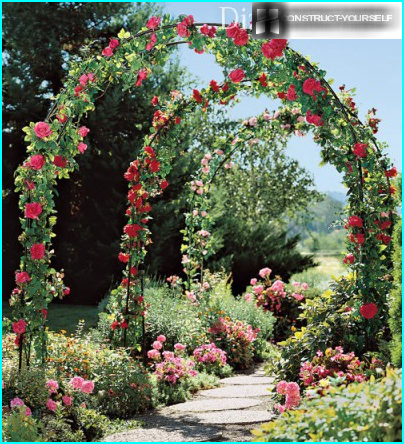 They have different shapes and can be matched to your landscape. The main thing - the installation accurately align the level of the edge that was not noticeably artificial bowl. Most gardeners create a so-called "film"reservoirs, where water is held by the pond lined with the entire bowl of the film. The choice of films is large enough, but it is considered to be the most durable butyl rubber thickness of 1 cm. It is brought to order different sizes, so you can search for any cup reservoir. Cheaper considered a film of polyvinyl chloride. They are slightly thinner butyl rubber, but in a different color, so you can make the bottom of the blue, green and even brown. If such a film gently lay and avoid damage during installation, then at least it will last 10 years. If you use a regular film, it is necessary to lay several layers and cover the 15-centimeter layer of sand to protect against UV and frost. If you have decided on the width and length of the futurepond, then calculate its depth. To lower this figure should be divided by 6. For example, the depth of the bowl 3 X 5 m is equal to 3: 6. = 0.5 m length / width calculate the following formula: length / width double pond + + depth meter stock. This calculation will allow to avoid shedding the ground at too great a depth, and do bottom of the fine. 0.5 X 5 + 2 + 1 = 7 meters in length. 3 + 0.5 x 2 + 1 = 5 meters width. Digging up the cup on the markup, making the bottom belowthe desired depth of 5 cm. 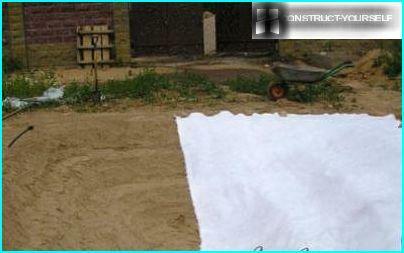 from the bottom remove all large stones, level ground and fall asleep on top of a layer of sifted sand (5 cm). 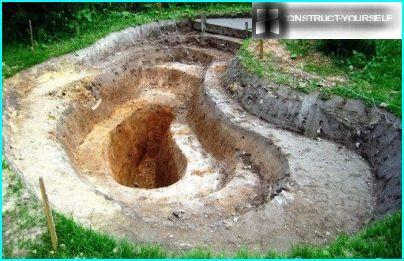 It is best to do the excavation step. All the top edges align, checking horizontal level of the building. The bottom is lined with non-woven fabric (the batting, sinteponor felt), and over - the film. The cloth will prevent the film from coming into contact with sharp sand grains. The film is lined with neat, the substrate is not moved out. The edges of the film must go beyond the cup somewhere in the 40-50 cm. Their we do not fix. We fill the pond with water, after pressing it with stones. This is done to foil lined with tightly lay to the bottom and walls of the bowl, preferably without tension. The edges of the film on the surface covered with earth and strengthen decorative stones. It remains to pour fertile soil and planted in her plants and shrubs. Pond fill plants, which will be able to get along on your cup depth and vymerznut winter. We must remember that the arrangement of the reservoir in the countrybetter to postpone for a couple of years if the kids live in the house. According to statistics, children under 3 years old are able to drown in a pool, the depth of which does not exceed seven centimeters. If the body of water has appeared, it will make every effort to protect it.